Our most popular shower and bathtub bars provide safety in the bathroom. As we age and lose agility, bathing can become difficult. Falls in the bathroom, especially the bathtub, shower areas, are a leading cause of injury. Grab bars and handrails create a safer environment and make it easier to carry out your daily activities and will provide support to help you maintain balance. Not just for the elderly or people with disabilities, everyone will benefit by making it easier to get in and out of the bathtub or shower. Our products increase your independence at home and make it more comfortable! This Left Hand bar will make getting in and out of the bathtub or shower much easier. When entering the bathtub or shower from the right side, use this Right Hand configuration. Shower bar, Left Hand shown, (dimensions same as #56R). Note: 2 piece construction. Shower bar, Right Hand shown. Note: 2 piece construction. This bathtub grab bar can be flipped to use in a right or left hand configuration. #46 handrail straddles a free standing bathtub. Bathtub bar, Left Hand shown, (dimensions same as #51R). Bathtub bar, Right Hand shown, also available Left Hand. For custom sizes, contact us with your wall dimensions. Left Hand shown, (dimensions same as #53R). See note: 2 piece construction. The ultimate in bathtub railing! Right Hand shown. See note: 2 piece construction. 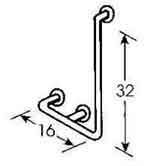 Note: To allow shipment via UPS: Grab bar #53, #56 and long custom bars are fabricated in 2 pieces. They are joined by using the supplied splice kit and internal sleeve. Although the fit is near perfect, there will be a hairline joint. This grab bar can be flipped to use in a right or left hand configuration. * Slip joint connections are standard on grab bars marked with *, providing installation and configuration flexibility. Specifications: 1-1/2" diameter OD, heavy duty, commercial grade, type 304, 18 gauge (.049), brushed satin stainless steel. All bars are shipped with heavy duty concealed set screw flanges. Dimensions: Grab bars are drawn and manufactured according to centerline dimensions unless noted otherwise. To figure total length, add 1-1/2" for each end flange, add 3/4" to the bar center line dimension and the ADA requirements of 1-1/2" space between the grab bar and wall. For instance; the total wall space required for #75 is 39-3/4" x 27-3/4". Adaptive Access specializes in accessible construction and remodeling, we know how important it is to get the right grab bars the first time. We encourage you to take that extra step to contact us and benefit from our experience! We'll be here after your purchase to help with installation or other questions you may have.